Currently, when I’m out on the motorbike, I have two options for leg wear – either my 5.11 Tacticals with the Alpine Stars solid knee protectors, or my Dainese leathers. I’ve always felt a bit vulnerable in the former, but the truth is, for quick runs and errands (statistically when you’re more likely to have an accident) and especially in the hot weather, the leathers can be a bit cumbersome to get on, sit in traffic with and walk around the shopping centre in. 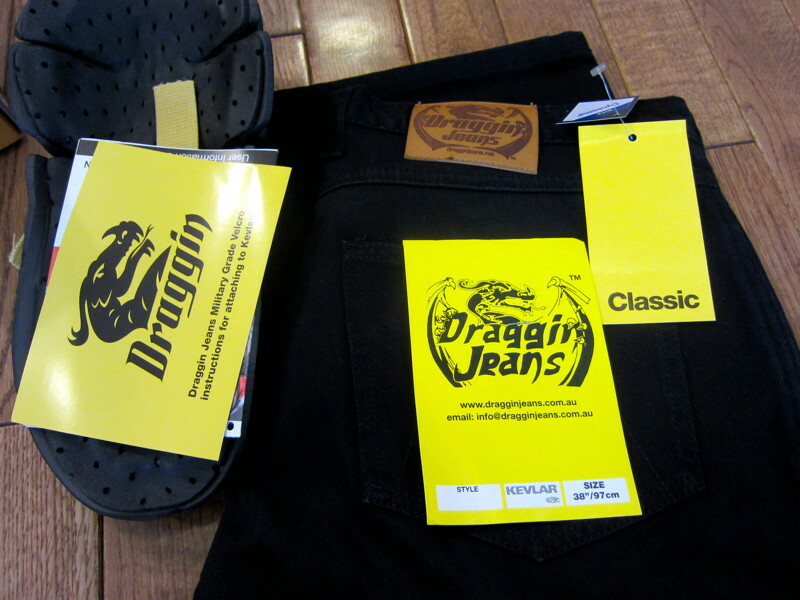 With that in mind, I went looking for some biker oriented jeans or similar, which either had pads, or under which I could use my solid knee pads.I looked at a few places like Aerostich, but after trawling forums, found that Draggin’ Jeans always seemed to get decent reviews. They do a fair sized selection, but in the end, I went for their basic Classic jean – nothing fancy, a thick weave denim with their standard Kevlar weave at key points inside. Obviously ordering online is always a bit worrying for clothing, but for better or worse it seems that Draggin’ has some limits which may help – as far as I can tell, they only sell 34″ inseam trousers for men. This is a bit longer than my usual 30″ but I thought I could get them altered with minimum fuss, and bike jeans do need to be a little longer than usual. So how are they? They’re really good. Lets cover fit first: the waist is pretty much exactly what I was expecting in terms of size, and similar to jeans I’ve bought in the UK – but not in Japan. The leg didn’t actually seem that long, and of course sat on the bike, with boots on, you want it to cover your ankles, and they did, and despite obviously being a bit long, they didn’t drag, and a simple measurement showed the seam at 33.5″ so it is pretty much what it says. They’re very well made – thick denim material with quality stitching. The yellow kevlar weave inside is particularly striking, but it doesn’t feel rough when you’re riding, and does seem to feel like it’s going to help if you end up sliding on some asphalt in the future. They have the usual jean pockets, but I found them a little difficult to get into, which may be a problem for some, but I tend not to put anything in my trousers on the bike anyway. On the road with the bike, they’re really comfortable, and blocked a surprising amount of wind, though I haven’t tested them in any rain, but I would expect they’d react like all denim – might become cold and wet quickly, with a long dry time. That said, they’re definitely worth the money and a huge improvement on normal jeans and even the 5.11s. I also received some of the basic Knox kneepads, which seem pretty good – 3D molded solid core with a foam outer; interestingly the way to affix them to the jean is to glue a strip of ‘military grade’ velcro (supplied) to the knee area of kevlar weave, and then affix the pad to the corresponding strip of velcro on the pad. I haven’t done this yet, but these are Draggin’s own guidelines, so I see no reason they shouldn’t. My only point of note on these is that if you had the velcro in, but for some reason didn’t wear the pad, you’re probably going to get a decent red mark on each knee from the velcro. They’re not cheap though – 249AUD (they’re an Australian company), which is about 175USD or about 20,500yen plus shipping. Are they worth it? Yes, I would say they are – a vast improvement over even tough jeans, and whilst not leathers, they do feel safe, warm and comfortable.